The Mütter Museum welcomes visitors of all abilities to experience the history of The College of Physicians as one of Philadelphia’s founding centers for medicine through our collections of anatomical and pathological specimens, medical instruments, and models. The Museum is wheelchair accessible at the east entrance of our building, on Van Pelt Street (which runs directly behind the Museum, parallel to 21st and 22nd Streets). At the right of the glass door marked “College of Physicians of Philadelphia," you will see an intercom speaker and talk button. Press the button, and when someone responds, say that you are visiting the Museum and need access. Someone will come to assist you. Personal Care Assistants (PCAs) are always provided complimentary admission when accompanying a paying visitor to the museum. Once in the museum, the lower level galleries are also accessible by elevator. See a security officer or Visitor Service member for assistance. Manual wheelchairs are also available free of charge on a first-come, first-served basis at the admissions desk. Accessible restrooms are located on the first floor behind the admissions desk. Single/Family/All Gender restrooms are also available on the second floor. See a security officer of Visitor Service member for assistance. For visitors who are blind or have low vision, our engaging, multi-sensory tours combine vivid verbal description with opportunities to learn about medicine and anatomy through tactile exploration. Mütter verbal description tours provide an opportunity for visitors who are blind or have low vision to learn about medicine and the body through exciting, vibrant descriptions and tactile exploration. Explore the Mütter Museum’s collection with a skilled museum educator trained to provide vivid, detailed verbal description of the works on display, while experiencing a selection of objects through touch. Manual wheelchairs and stools are available for all touch programs. These free, one hour tours take place when the galleries are closed to the general public. Tours are held four times a year and include refreshments. Tours are organized with support from Philly Touch Tours. For questions or to inquire about the next scheduled tour, please contact us at accessibility@collegeofphysicians.org or (215) 372-7314. 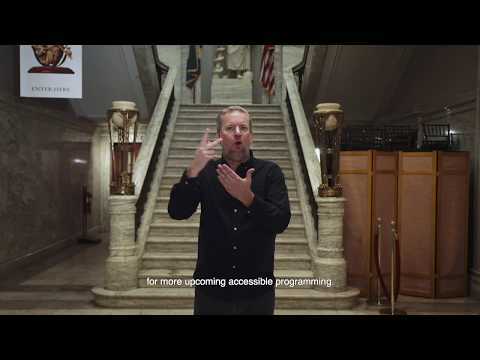 The Mütter Museum is now offering tours in American Sign Language for the Deaf and Hard of Hearing. Experience the Mütter's famed collection in visceral depth, led by a tour guide and an expert ASL interpreter from Hands UP Productions. This event is strictly for members of the Deaf and hard of hearing communities. For questions, please contact us at accessibility@collegeofphysicians.org or (215) 372-7314.